There are far more needs that a baby require compare to adults in terms of daily survival and basic necessities. As individuals who still have not fully developed their motor functions and ability to do specific tasks, they need the utmost love and care from their parents or the people that look after them. 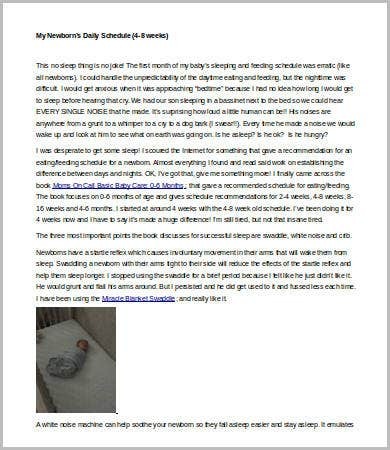 Much as we have our busy schedules, babies must have their schedules too so that their body can adapt to the things that they are required to do and little by little get used to it until they can already help themselves do basic tasks like eating, walking, and going to the bathroom on their own. 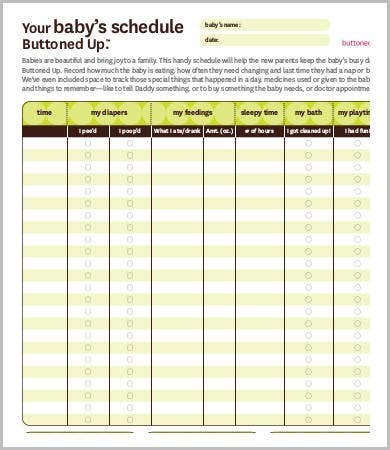 Our schedule templates can help you in creating an efficient baby schedule. The time of feeding. Since babies still cannot feed themselves, they need assistance in terms of this human functions. Moms also need to ready themselves for breastfeeding for as long as they want them to and if the milk supply is still available. It will also help the baby familiarize when is the time that he or she should already eat. Nonetheless, as babies, their eating pattern may vary depending on how they feel. 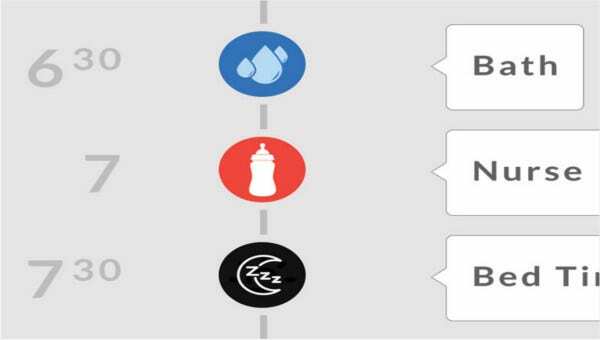 So adjustments should be done depending on the baby’s reaction to the feeding schedule. The time of nap. Babies tend to not know which time to sleep, especially during their early months. They may sometimes be awake at night and can easily fall asleep during daytime. Giving them proper sleeping habits and allowing them to sleep through different ways can help them in feeling comfortable with sleeping schedules. Playtime. You need to know your babies’ reaction during playtime as it will allow you to assess his or her development in terms of different areas of improvement. Babies may be interested to do specific activities, but they also get bored once they’ve already had too much of something. You need to identify the signs that your baby is making on specific situations so that you will be able to properly address his or her concerns. 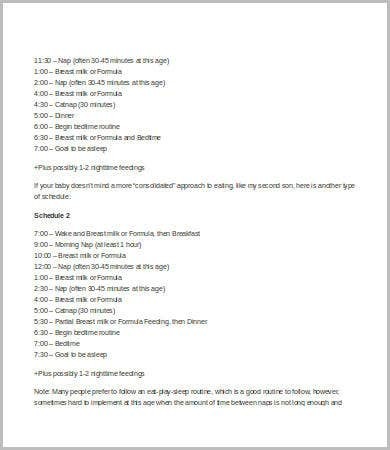 That being said, a baby schedule then is important so your offspring can grow into a wonderful, playful, happy little ball of joy who can then grow into a well-rounded person. 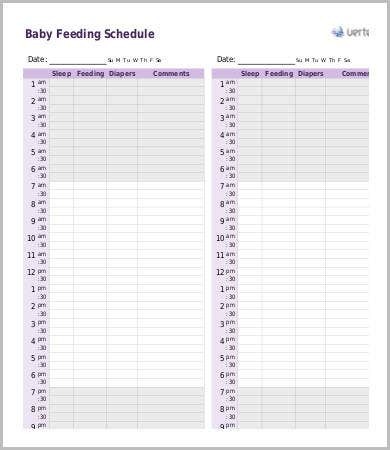 You may take a look at our Daily Schedule and Baby Feeding Schedule samples and use them as necessary. Also, you need to regularly check on baby’s diapers and know when is the appropriate time to change it. Babies often show signs of irritation if he or she is uncomfortable with his or her diapers and other factors. 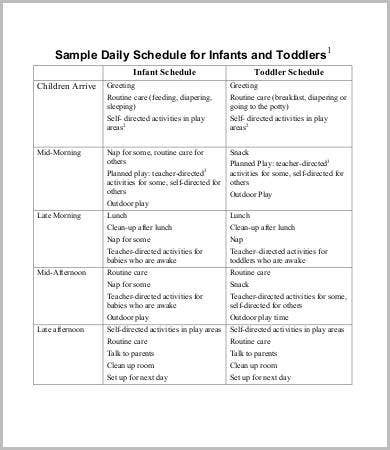 As a parent, always look out for these signs as it will help you make adjustments to your baby’s schedule. 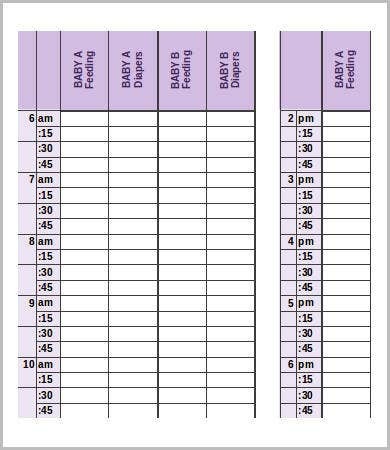 You can make an Hourly Schedule or a weekly schedule for your baby. It all depends on the activities that you want to practice as a parent and the time that you have in taking care of the baby. 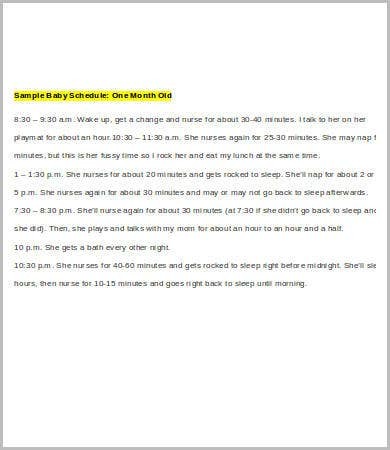 Remember to always consider the number of months that the baby has already lived as it plays a huge factor on the needs that he or she needs in every specific stage. 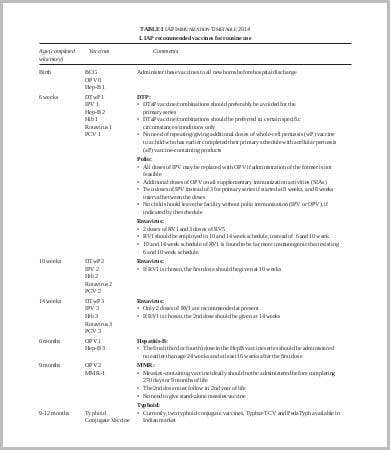 You can do a lot of research on the proper ways of scheduling baby activities so that you are all equipped with basic knowledge when you are already needed to create your own.